The marine grade aluminium alloy plate 5083 5086 material used in the shipbuilding industry have good corrosion resistance, weldability, plasticity. Due to the requirements of ship construction and working environment, a certain tensile strength, yield strength, elongation and impact resistance are still needed. Adding magnesium and silicon to aluminum alloy can effectively resist seawater corrosion. 5083 aluminum alloy is a common aluminum alloy grade in shipbuilding process. Therefore, 5083 aluminum alloy is also called marine grade aluminum alloy. At the same time, the alloy is also widely used in other industrial fields. The advantages of 5083 marine grade aluminium alloy plate in the marine field are its high strength, corrosion resistance, plasticity and excellent welding performance. 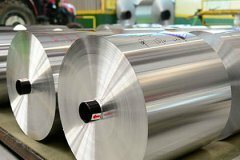 With the advancement of technology and progress, the production costs of aluminum plates were gradually reduced, and they were used as lightweight materials to make yacht shells, hull superstructures, masts, and port infrastructure construction. The 5086 aluminum plate is another grade of marine aluminium alloy plate. It has better corrosion resistant and the hardness, these potential performance improvements reduce the number of welds. With the characteristics of shape, weldability and yield, the 5086 and 5083 marine grade aluminium alloy plate with DNV certificate are welcomed by large high-speed ship manufacturers.